Here is a simple and effective game that you can play online with your virtual team. Play it as a virtual team building activity to highlight the importance of communication within your virtual team or use it as a virtual team ice-breaker game. 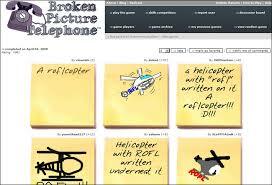 The game is called Broken Picture Telephone. While having fun and playing together your virtual team will also be learning something about how they communicate with each other. The game is really a game that focuses on communication (or miscommunication). Playing this game shows the importance of clarifying our understanding of information that is communicated between virtual workers. It shows how easily miscommunication can happen (especially in the world of virtual teams). The game is fun; it encourages your virtual teams to connect and have a good laugh together – which in turn will help build stronger virtual team relationships. The game can be played online from anywhere in the world (obviously remote workers require internet access) there are no special downloads required and it’s totally free. This virtual game suits remote teams of various sizes and can be adapted to the amount of time you have to play the game. You’ll need to register the virtual team members that will be participating in the game. Each user requires a username, password and email. Start a “Private” game for your own virtual team by clicking “Start a Game”. There you have the option to select how many rounds you want to play (this will determine the amount of time to play) and also gives you the option to select a private game. You can then select your virtual team members who will access the online board and participate in the game. The virtual team players should be online, ready to receive their invitation to the game. The first time you play, you should allow time for your team members to view the game instructions and watch the demonstration video. At the end of the game your team will enjoy looking at the results. They will see how differently we interpret and perceive information while having a great laugh together at the same time.